Last time I wrote about the priceless benefits of documenting an entire town. 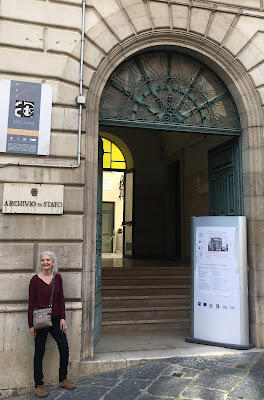 Today I'm focusing on another pillar of my genealogy philosophy. It can help you produce a valuable family tree. I'm a terrific on-the-job learner. I've become a whiz at organization and efficiency. 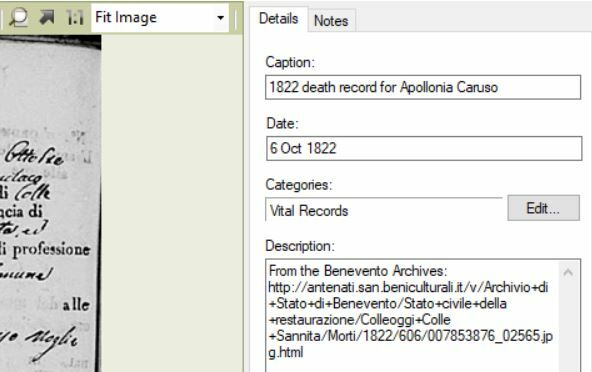 I like to apply best practices from my work life to my genealogy life. Here are my top organization and documentation techniques. They've become second nature, and they make my tree stronger every day. Do what's logical for you and what you think will be logical to your genealogy research heir. I added more folders as necessary: naturalization, applications, passports. The combination of my simple file folder structure and file naming discipline makes it easy to click my way to a particular document. I don't have to search my computer or wonder if I'm overlooking the file. I make a habit of naming census files for the head of household. 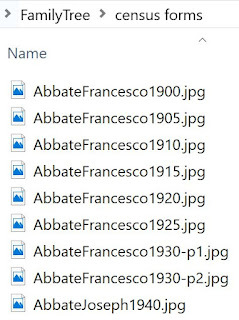 In Jacob Auster's case, these file names are crucial because Jacob used a different first name each time! It looks like I need a death record for Luigi Pisciotti. 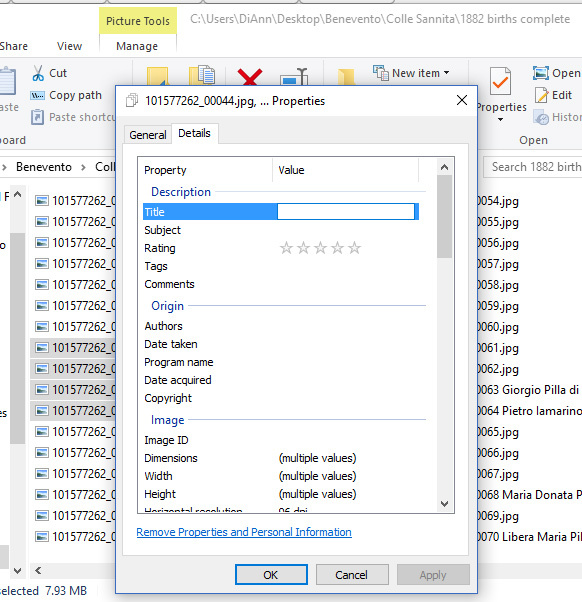 As soon as I download an image, I crop it in Photoshop, name it according to my style and save it in the proper folder. 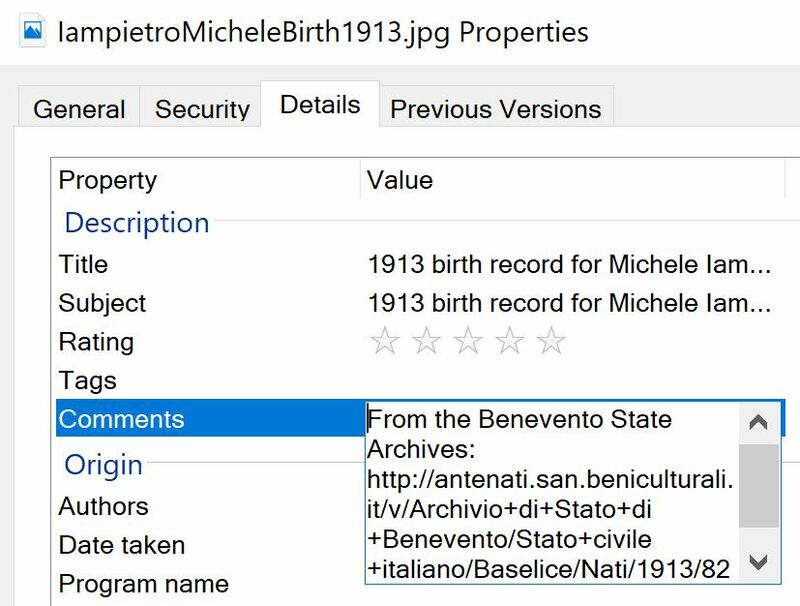 Then I right-click the file, choose Properties and click the Details tab. I fill in the empty Title and Comments fields. Whatever I put there stays with the image file. 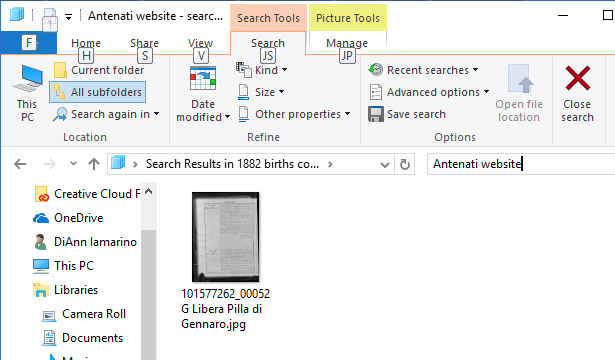 For the Title, I enter exactly what I want to see in Family Tree Maker, like "1825 birth record for Luigi Pisciotti". In the Comments field I include the URL where anyone can find the original file. If it applies, I'll include the line number(s) of interest. When I add the image to Family Tree maker, it imports those two fields. 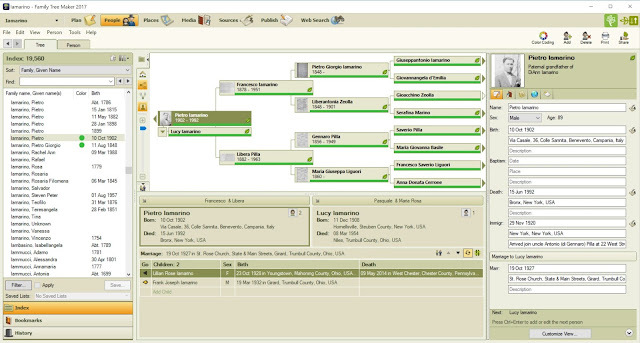 Anyone finding a common ancestor in my tree on Ancestry.com also sees those important image details. 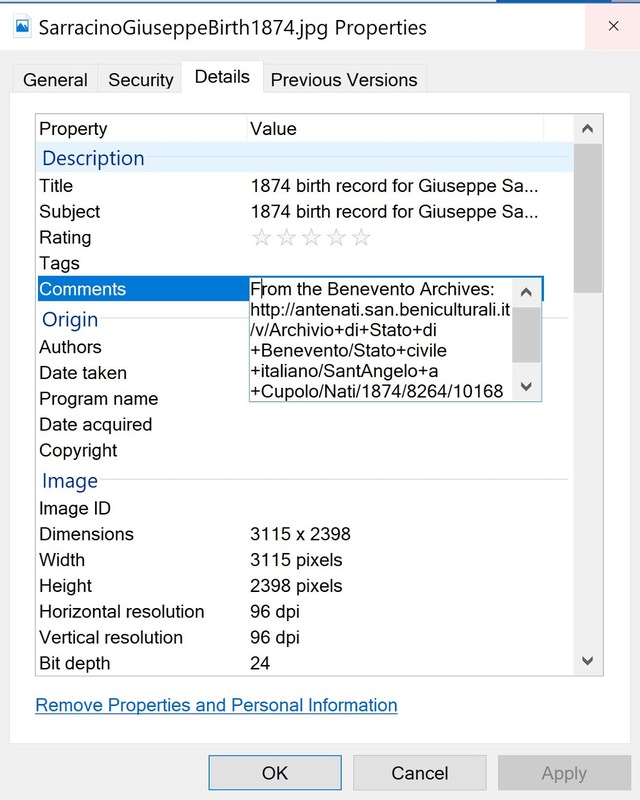 To learn more, see How to Increase the Value of Your Family Tree Images. I like my source citations to be simple. 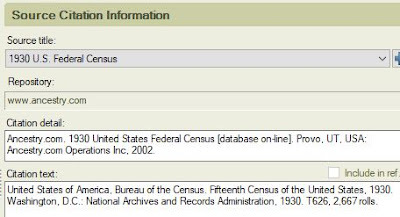 For all the census years, I name the citation as simply as "1930 U.S. Census". Most other sources I name exactly as they appear on Ancestry.com. For example, "New York, Index to Petitions for Naturalization files in New York City, 1792-1989". 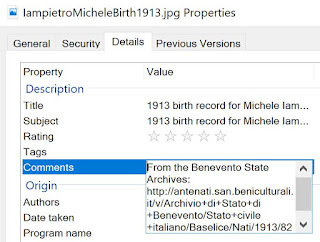 But in the Citation detail field I add the description of the document collection, taken right from the source. Example: "Ancestry.com. New York, Index to Petitions for Naturalization filed in New York City, 1792-1989 [database on-line]. Provo, UT, USA: Ancestry.com Operations, Inc., 2007." 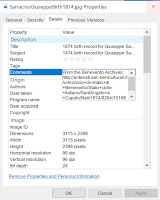 In the Citation text field, I copy more information from the source. Example: "Soundex Index to Petitions for Naturalization filed in Federal, State, and Local Courts located in New York City, 1792-1989. New York, NY, USA: The National Archives at New York City." The important thing is to add a source to each fact as you enter it. Adding a birth date? Attach the source. Adding an address? Add the source. Immediately. To learn more, see Trade Up to Better Family History Sources. While this last item is important to me, some of you may think it's nothing but extra work. I keep a single spreadsheet of each document I've attached to someone in my family tree. 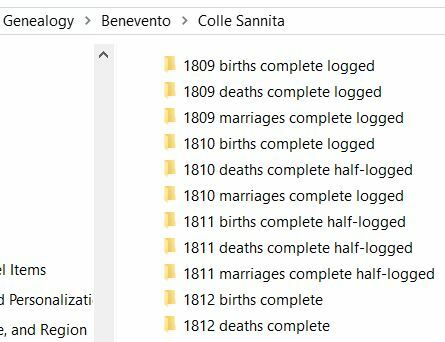 If I'd opened that spreadsheet this morning, I wouldn't have bothered downloading a 1907 marriage record for a cousin—because I already had it! You can't keep all these facts in your head. A document tracker keeps you from wasting your time. Plus it shows you what you're missing. 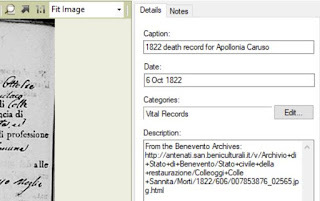 To learn more, see Track Your Genealogy Finds and Your Searches. 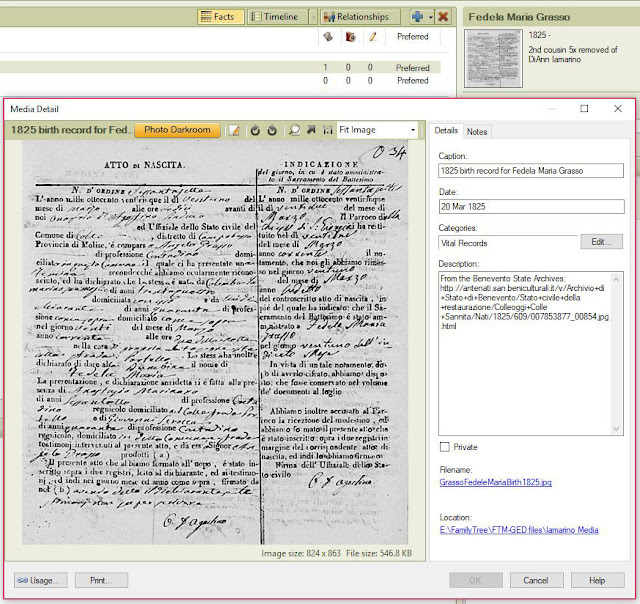 Next time you download a document image for your family tree, think CRAFT. If you've already got your category folders created, think RAFT (picture actor George Raft flipping a coin). 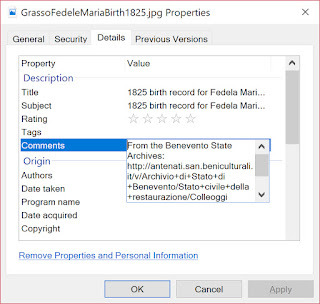 Recognize means name your files in a way that helps you recognize what they are in the future. Annotate means add details to the properties of each image so it makes sense even out of context. 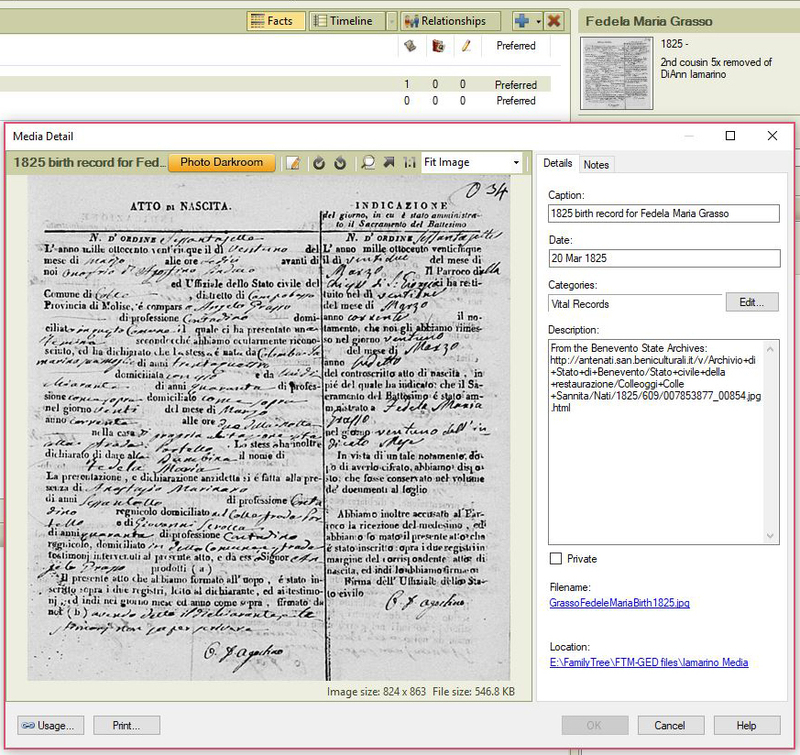 Find means add a source citation to each fact so you can find where it came from. Track means update your inventory so you'll always know what you've found. 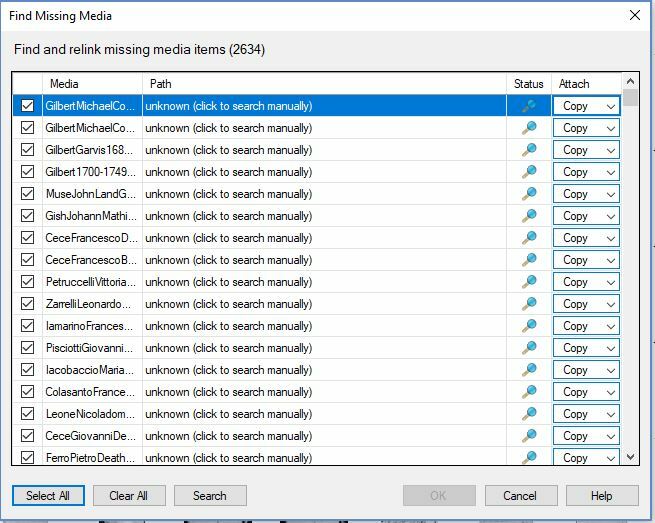 As a long-time computer professional, I'm embarrassed that I didn't learn this till today. 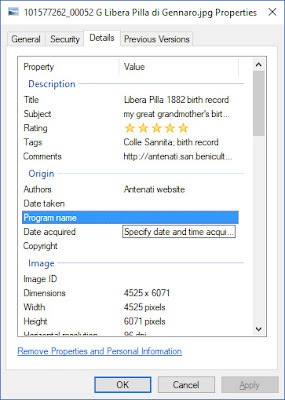 You can add custom details and descriptions to any JPG file on your computer. 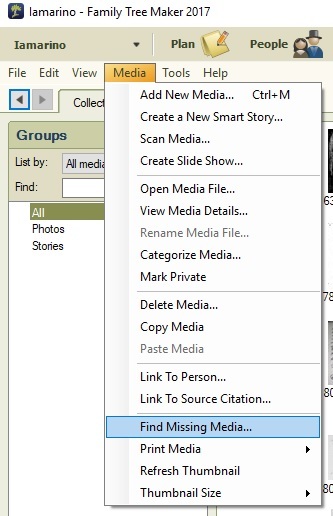 Your customizations will stay with the file when you copy, move or share it. 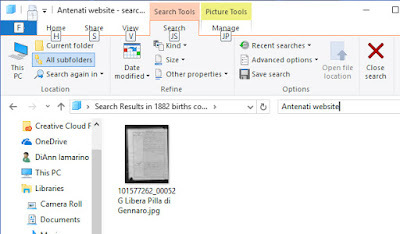 You can search for your customized description in a huge folder of images and quickly find the file you need. You can rename your images as needed. 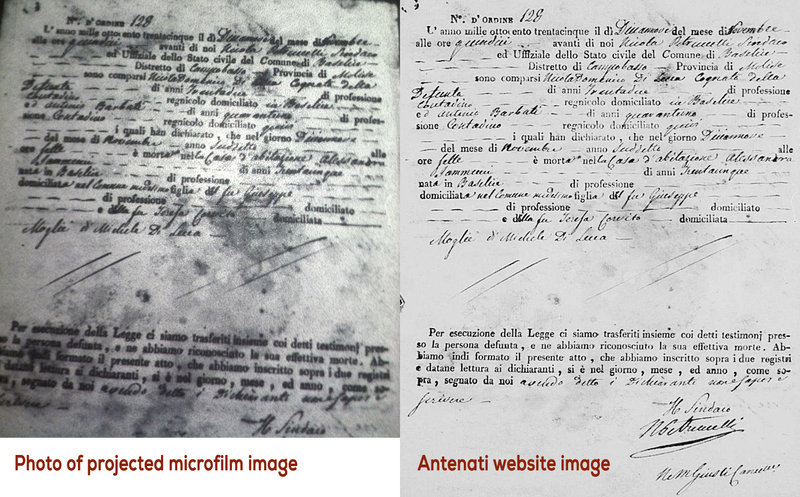 I have thousands of downloaded vital records from the Italian Antenati website. 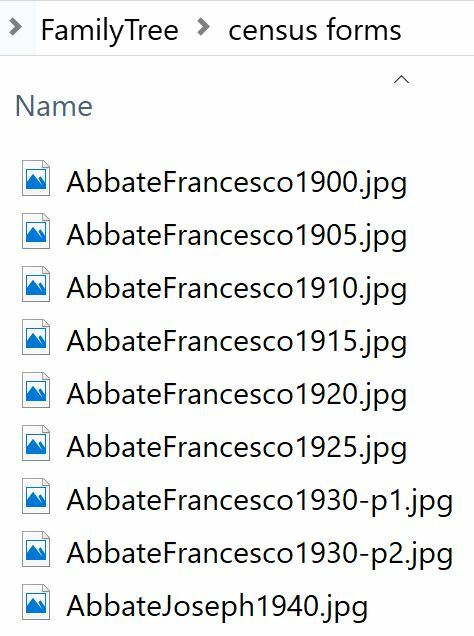 As I go through them, I like to rename some of the files to include the name of the subject. If it's a close ancestor, I might include "my 4GA" (my fourth Great Aunt) in the file name. But now I can get more specific—especially with those direct ancestors. This works on Windows or Macintosh. 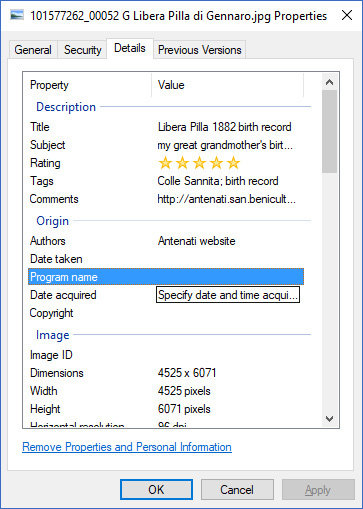 In Windows 10, right-click the image and choose Properties. Then click the Details tab. 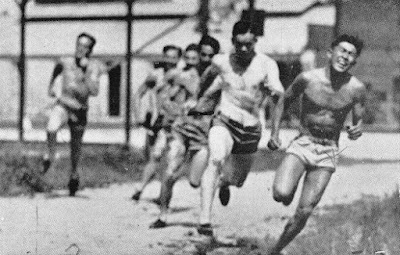 Many of the fields are editable. I never thought to check that before! 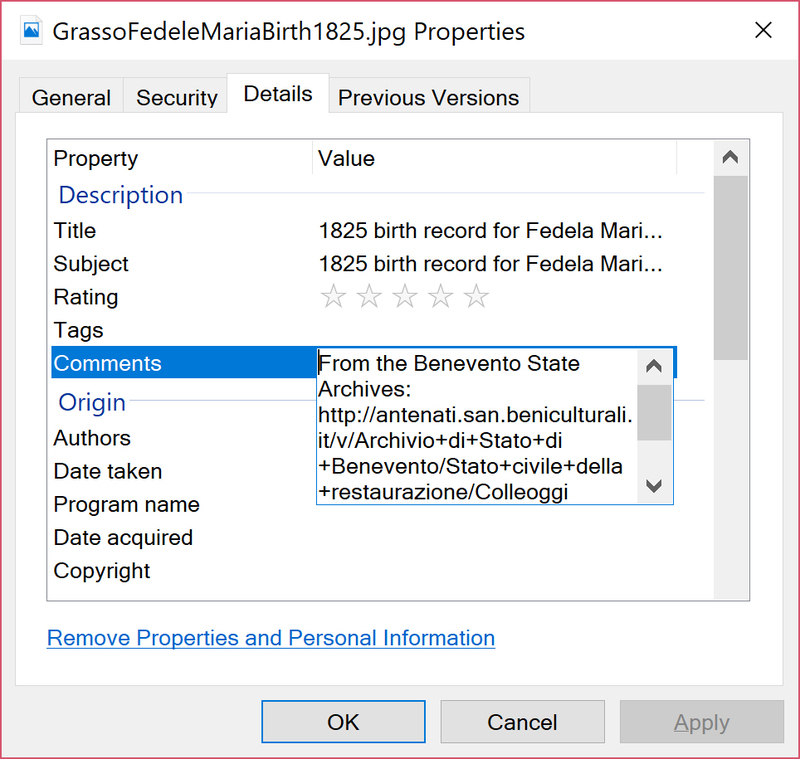 The Description and Origin sections are editable. For Windows 7 instructions, see this short tutorial. For Mac users, see these instructions. I'd recommend giving lots of thought to your own set of standards. Then start with the images that are most important to you. I'll start with wedding photos and my closest relatives' vital records. Searching is easy with customized descriptions. Ironically, this tip is the solution to the problem I was having when I stumbled upon it. I wanted to find my great grandmother's birth record to send to my cousin. 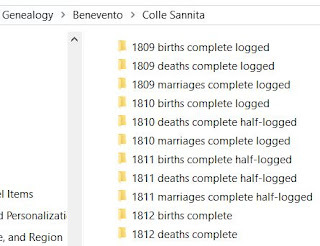 I couldn't remember her year of birth, and I didn't want to wait for Family Tree Maker to open. So I tried looking in several folders without success. I finally opened my tree on Ancestry.com and found the correct year. Then I happened to click on the image's properties and discover I could edit them! Now a quick search for my great grandmother's name and "birth record" brings up the right image. How will image details make your family tree research a bit easier? Bonus: Select multiple images and edit their details at once.